How to Earn More Fees as a Consultant. If you’re a consultant would you like to expand your expertise and increase your client base? 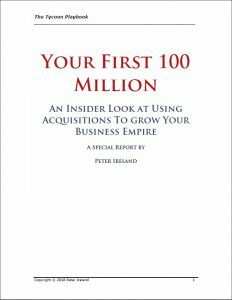 Would you like to be able to show clients how they can double or even triple their revenues in a year by utilizing small scale acquisitions? Occasionally, I will be asked if someone can use The Tycoon Playbook to make money without actually buying businesses. Not everyone wants to manage a business after all. The answer is actually a yes. It is possible to do so. Let’s look at a number of ways to make money with the Playbook without buying a business. Are you having trouble putting together the down-payment for your first business acquisition? Having a down payment in the bank works wonders in terms of boosting your confidence level when dealing with sellers, lenders, and everyone else. It turns you into a real buyer in everyone’s eyes. Brokers use your available down payment to screen you out quickly. If the seller is asking for $50,000 as a down payment and you can only show that you have $5,000, you’re banished.